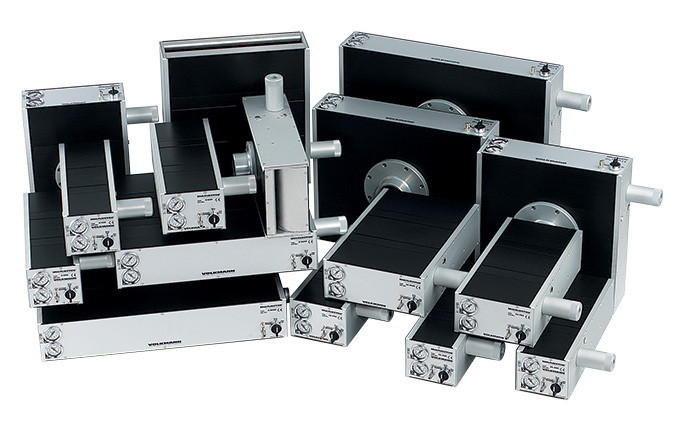 Volkmann has developed a unique, multi-stage Venturi vacuum pump, the Multijector, which increases overall operational efficiency in a vacuum conveying system. This patented Multijector pump incorporates the basic advantages of compressed air driven (Venturi) vacuum pumps – small size, low weight, simple design, little maintenance and wear-resisting operation – and has modified them to keep the same high vacuum, utilize the same energy but provide substantially more suction (induced air). A MULTIJECTOR accomplishes its efficiency though its advanced nozzle system, where additional nozzles are placed in line with the primary and secondary nozzle. Flap valves close automatically in order of pressure balance between their respective Venturi stage and its collective vacuum chamber. This special design of nozzles and aerodynamics gives Volkmann MULTIJECTOR vacuum pumps their unique efficiency. 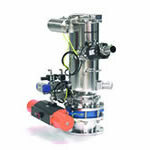 The Multijectors is available is several design options to best complement the vacuum conveying system. In Volkmann’s vacuum conveying systems, the Multijector is turned on only during the suction cycle. While discharging the separator, the Multijector is switched off. Unlike electrical pumps, the Multijector requires no starting time for the next cycle, and has no wear during start and stop operations. The Multijector saves about 1/3 of compressed air during discharging, while electrical pumps need to run continuously and require additional vacuum valves to shut off the vacuum conveyor during discharging.